Google has requested Mississippi Senator Cindy Hyde-Smith refund its $5000 contribution, according to an internal email obtained by Popular Information. The company has attempted to keep its request for a refund secret. [Redacted] here again, covering NetPAC for the US Public Policy team. I just wanted to update this thread to confirm that a request for a refund of the contribution to Senator Hyde-Smith’s campaign has been made. As previously noted, the contribution was made before Senator Hyde-Smith’s comments were made public; we do not condone the comments and would not have made the contribution had we known about them. An employee responded: “Is Google asking for a refund but not announcing it?” As of Monday afternoon, the NetPAC representative did not reply. Hyde-Smith faces a run-off election against Democrat Mike Espy on Tuesday. The posture of the Silicon Valley giant reflects its complex efforts to appease both sides of the political spectrum. It is seeking the contain the public controversy from donating to a Senator who recently said she would attend a “public hanging,” while not provoking right-wing elements who accuse the company of having a liberal bias. Google’s contribution to the Hyde-Smith campaign was first reported by Popular Information on November 13. The donation was filed with the FEC by the Hyde-Smith campaign the same day. But in a statement to Popular Information, the company said it had sent the contribution before Hyde-Smith’s controversial remarks became public on November 11. If Google had known about Hyde-Smith’s comments the company said, it would not have donated. This contribution was made on November 2nd before Senator Hyde-Smith's remarks became public on November 11th. While we support candidates who promote pro-growth policies for business and technology, we do not condone these remarks and would not have made such a contribution had we known about them. Google later told Popular Information that the check was sent to the Hyde-Smith campaign on November 6. Since that statement, Google has not responded to repeated inquiries about whether it would seek a refund from the Hyde-Smith campaign. Meanwhile, seven major corporations — Union Pacific, Boston Scientific, Walmart, Leidos, AT&T, Pfizer, Amgen, Ernst & Young — have asked Cindy Hyde-Smith to refund their donations. Major League Baseball also asked Hyde-Smith to refund its $5000 donation on Wednesday after Popular Information reported their contribution, dated November 23, less than 12 hours earlier. UPDATE (11/26, 5:19PM): A spokesperson for Google, Riva Sciuto, confirms that it has requested a refund from Cindy Hyde-Smith. “I can confirm that Google requested a refund for the donation,” Sciuto told Popular Information. 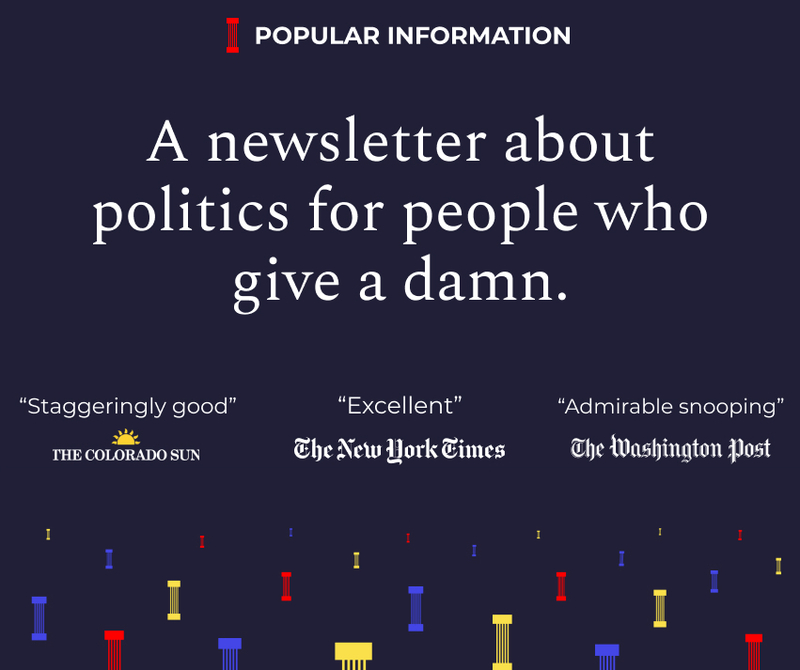 This is a special report from Popular Information, a newsletter with original research and fresh insight into the political news that matters most — written by me, Judd Legum. You can sign up for the free weekly edition at popular.info. Paid subscribers receive four emails per week. You can support independent, accountability journalism like this for $6 per month or $50 for an entire year. In return, I'll draw on my extensive background in politics and media to decode the chaos, and deliver perspective and context you won't find anywhere else. There are no advertisements, no filters, and no B.S. Subscribe now. Send me feedback at judd@popular.info.